A young man falls in love with a beautiful blonde. When he sees her being forced onto a luxury liner, he decides to follow and rescue her. However, he discovers that she is betrothed to an English lord and is now travelling to England to marry! He also discovers that his boss is on the ship. To avoid discovery, he disguises himself as the gangster accomplice of a minister, who is actually a gangster on the run from the law. A production of the 1962 libretto, the Cecilians’ portrayal of Billy Crocker’s mischievous advances on the beautiful Hope was full of over the top comedy and over the top musical numbers to accompany it! 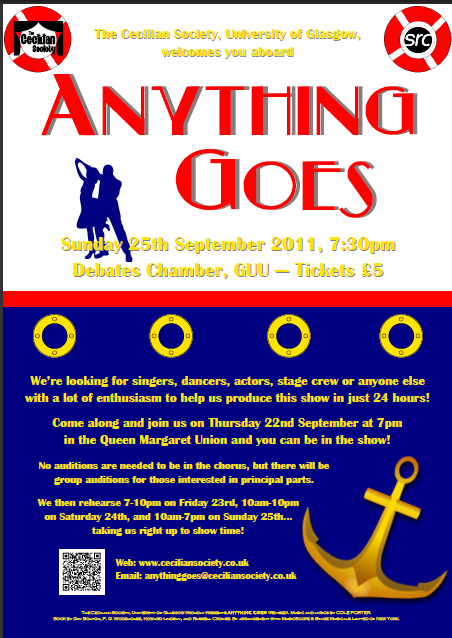 The title number, “Anything Goes,” is looked back on as one of the defining moments of the show – tap and all!